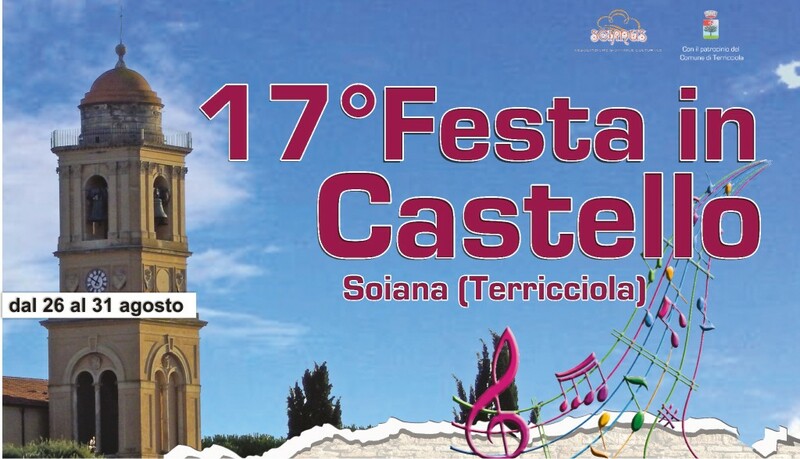 The “Festa in Castello” is a traditional event of “food and wine”, music, theater and history, that has taken place in Soiana since 1997, during the last week of august every year. In this week of festival you can find a lot of different stands all around the village: there are stands where you can taste and purchase wine and local food, there’s a charity stand, and in addition there is an exhibition of vintage Vespas and a little museum, set for the event, of antiques. There’s a Sangria stand too. In the square there is the food stand where you can have dinner, there is a wide choice of typical local food, from meat to fish, and every night there is a special dish. After dinner you can have fun with music and dancing or with a cabaret show, in fact every night there is a different program and the bar service stays open all night. This year, in the XVII edition, “The Games of the Villages” were re-introduced, an old tradition of the village where the neighboring villages challenge each other. The event is aimed at entertaining people and reviving the old traditions. The games are diveded into two steps, the first one is the theme parade, where each village organize a parade with a theme of their choice; the second step consists in a challenge of ability games. Eating here isn’t very expensive, and the quality of food and wine is absolutely great! The cost of entry is free. 10.00 p.m. Parade of overture “Games of Fraction” and presentation of the teams. EVERY NIGHT FOOD STAND AND BAR SERVICE ARE OPEN.